I have for you a very interesting and unusual piece for this week’s Outside the Box. It is not that I do not regularly send things by authors who see the world differently from me, but I rarely delve into the political and geopolitical world. My friend Dr. Woody Brock is one of the most brilliant game theory specialists that I know. He studied with the most accomplished game theoreticians in academia, and he regularly applies game theory to economics and investing. It is no understatement to say that ISIS and radical Islamic terrorism in general are a threat to the Western world, and it’s a threat against which we have so far not really developed any serious defense mechanisms. Rather, we are mostly just reacting to seemingly random events. Woody sent this client memo out last April, and I have read and reread it. He analyzes the conflict between the West and ISIS in terms of game theory. And because of our very values, he says that we end up playing the “game” in a way that predisposes us to continual frustration. I thought long and hard about whether to send this to you. I know I will lose a few readers over it, and I always hate that, but sometimes we have to think about the hard things. Woody is normally a mild-mannered guy with a patrician view of the world, but his conclusions here are neither mild-mannered nor anything less than what most people would consider radical. However, ISIS and radical Islam are at war with the entire modern world, not just Christianity. They are True Believers and are simply not interested in negotiating. In game theory, there is a fundamental distinction between positive-sum bargaining games, and zero-sum games. In bargaining games, it is assumed that both sides can be better off by agreeing on a way to “divide the pie” instead of playing their optimal threat strategies and ending up with no pie – or worse. All such games are positive-sum in nature. In a zero-sum game, however, there is no pie to divide, and no bargaining compromise is possible. If Woody is right, we in the West are playing the wrong game. That is something to think about as we go into elections not just in the US but all over Europe. What game theory will the leaders we elect operate under? Seems a reasonable question to me. And while I am personally extremely uncomfortable with some of Woody’s conclusions, especially when it comes to abrogating the rules of the Geneva Convention, it makes for a far more open discussion if everything is put on the table so that we can examine the issues from all sides. Fall is in the air in the Northern Hemisphere, and I am sure spring is beginning to show itself in the Southern Hemisphere, making much of the world a more pleasant place weatherwise. I hope where you are is as pleasant as Texas has been. Long-range weather forecast services I subscribe to are projecting a cold winter for the United States. We have avoided seriously cold weather in Texas for the last few years, but it looks like that lucky streak may be over. Terrorism is here to stay, and it is now beginning to impact the economic performance of many nations – in particular the performance of the service sector. In this brief Memo, we set forth a few thoughts about what underlies this phenomenon, and what to do about it. Relative Power of ISIS versus Europe: The usual determinants of relative power (e.g. wealth or the size of an army) are not very relevant to assessing the struggle between ISIS and the West. [By ISIS we refer not only to ISIS proper, but to any of its affiliated groups as well.] For the conflict is less a militaristic one than it is a war of nerves between Jihadists who carry out scattered sting operations, and Europeans and Americans lacking both the will and the coordination to properly respond. An additional source of Jihadist power stems from their status as True Believers, making them a very dangerous kind of opponent. Their moral certainty immunizes them against normal threats such as being killed. The number who do not fear death is sufficient to spell trouble for decades ahead. What is it that makes these extremists so morally superior, and so hateful of the West? In part, their superiority stems from their absolute faith in the truth of the teachings of the Koran. But this is only the tip of an iceberg of hatred. For their religious convictions are amplified by their detestation of the cultural, economic, ethical, and political values of Westerners. At a deep level, their terrorism stems from their hatred of modernity itself. We in the West are seen as weak and morally dissolute. For not only do we possess no religious fervor, but we lack moral resolve of any kind due to the anesthetizing effects of our materialistic, welfare-based social system. Such ethical values as we have stem not from fear of any God, but rather from an attachment to mushy concepts of “fairness” ranging from the “right” to nine weeks of vacation, to t he right to never be drafted to fight a war. In the US, citizens’ erstwhile chant of “give me liberty or give me death” has morphed into “give me liberty or give me latte.” All in all, ISIS’ conviction of holding the moral high ground is a major source of their power over the West. Reinforcing this power of fundamentalists is their strategy of implementing fragmented hit-or- miss strikes. They specialize in ongoing, unnerving terrorist attacks in public places. The West’s superiority in the number of security personnel and in intelligence-gathering does little to prevent these random attacks which can occur in hundreds of different emporia. In this regard, it is sobering that more than 5,000 EU-based fighters have already been to Syria for training in terrorist tactics, according to the US-based consultancy Soufan. This number will grow given the poor economic conditions in Europe where the unemployment rate of males under 30 exceeds 25% in many nations. Finally, today’s ongoing Jihadist attacks are concurrent with the new European immigration crisis. Given the implications of soaring immigration for tighter border controls, the increasing threat of Brexit, and problems endemic to the Euro, it is likely that the EU as we have known it will cease to exist. There will then be no semblance of any “unified” EU stance against ISIS. Instead, we will observe fragmented and ineffectual responses as well as the suspension of many civil liberties now taken for granted. This brief analysis suggests that the power of ISIS against Europe is much greater than might appear to be the case, despite Europe’s greatly superior power as traditionally measured. A War against Modernity: The importance of the culture war underlying the Jihadists’ hatred of Westerners cannot be understated. In their eyes, we are modernist devil worshippers. Women should be kept at home, devoid of any rights. They should be virgins when they marry. Adultery is a sin punishable by death, as is homosexuality. The fact that many citizens of Muslim nations do not share these views does not seem to matter. Consider Iran: the majority of the people value democracy, and even look favorably on the US. But so what? The Mullahs and the Red Guard rule with an iron fist, as we have seen during the recent elections when the candidates favored by most voters were stricken from ballot list. Moreover, Iran’s autocratic leaders are out in front in an effort to fund terrorist groups, in one form or another. We are not talking fine points of Shia-Sunni theological controversy here. By every means possible Isis is at pains to let us know they will kill as many of us as it takes to sow such mayhem in the heartland of the kaffir world that it will be impossible to resist mobilising the “Crusader” army for the promised apocalyptic showdown out of which the Caliphate will emerge forever victorious. Contrast ISIS’ moral resolve with the pusillanimous attitude of Westerners. Most assert their disapproval of fundamentalism, of course. But their live-and-let-live attitude sees it as a “right” for people to “express their views” and espouse any religion they wish – including the Religion of Hate. The problem with this view is that the Religion of Hate is unlike any other religion in espousing the murder of all non-believers. Excessive tolerance further undermines the will of the West to fight back against Jihadism in a resolute way. Most of the analyses of how the West should confront fundamentalism fail to make this all-important distinction. Analysts implicitly assume that negotiation strategies exist, strategies that will somehow end up with an acceptable compromise. President Obama’s stance towards Iran, Russia and China offer examples of this approach. In all three cases, he turned the other cheek, and attempted to “reset” relations with these nations expecting they would reciprocate. All would end up better off. But his antagonists ended up taking full advantage of his weakness, reneged on many agreements, and made Obama look as incompetent at bargaining as he has proven to be. Professor Schama is right in his comments above. He is stating that, in effect, we are playing a zero-sum game. ISIS wants nothing from us in exchange for something. They simply want to destroy us. Analogously, Iran has no intention of settling with Israel. Its stated goal is the elimination of Israel. In such cases, the optimal strategy (for the West) is to identify the enemy’s vulnerabilities, and having done so, to sow as much grief and pain as possible. The fact that the enemy are scattered and that some of their recruits are happy to blow themselves up does not relieve us of the responsibility to hit where it hurts: recruits that do not wish to die (the vast majority), all training camps (we know where some thirty of these are located), family members, etc. We must pursue such targets both on their home ground, as well as within the EU and the US. There is also th e question of how to extract intelligence from terrorist murderers who are captured. Just as an intelligent economist does not believe in free trade for a nation unless other nations follow suit, likewise enemies should be treated in accord with the Geneva Conventions only if they themselves adhere to them, adherence enforced by, say, an effective United Nations if one ever exists. Saying this is, of course, politically incorrect in the extreme. But reality beckons. The currently fashionable suggestion that what is needed is “for Europe to better ‘integrate’ immigrants” is as vacuous as the citations above assert. Most immigrants want to and are able to integrate over time. They end up great assets of the nations they immigrate to. But as a matter of faith, the bad guys will never integrate into that world of sinners they hate. The West needs a coherent, broad-based, long campaign dedicated to destroying every aspect of terrorist operations. This need not imply a decade with large numbers of troops on the ground. But there will be phases requiring such a presence. Just consider what Russia achieved in its recent and relatively mild strategy against the opposition to the Assad regime. They hit hard, it worked, and they have now pulled back – for the moment. Their effectiveness yet again renders the indecisio n of President Obama a national embarrassment. Within Europe, security must of course be tightened, but not at the expense of the crippling day to day economic life of people – precisely the outcome ISIS seeks. Leaders should encourage a much more stiff-upper-lip response by citizens than they have. There is one common denominator of all True Believers, namely a lack of sense of humor. This is as true of terrorists as it is of today’s political correctness police in the US, spearheaded by those who traffic in wooly ideas about gender and class. What is happening on US campuses is outrageous, and recalls the moral absolutism espoused by Jihadists overseas. Freedom of speech is being seriously abridged, as are rights of free association. To repeal the right to free speech, all that is needed is some belief that certain comments are “inappropriate,” to use the word of the moment. “Trigger notices” warning that eight Shakespeare plays should not be taught constitute a reductio ad absurdum on the part of university heads. As for the rights of male students to a fair hearing in the case of alleged sexual harassment, hyper-risk-averse “administrative panels” now serve as prosecutor, judge, and jury. There is often no way for an accused male student to receive a proper defense. When the right to self-defense is abridged, it is time to vacate the new status quo. What US Chief Justice Oliver Wendell Holmes wrote in 1929 about the all-important right of freedom of thought and speech (cited at the opening of this essay) remains as true today as it was eighty-seven years ago. Silencing people who say things you do not want to hear amounts to a surrender to oppression. If the PC police resent this reality, they should perhaps recall the words of President Truman: If you can’t stand the heat, get out of the kitchen. Mr Putin wants to erase the humiliation of the collapse of the Soviet Union. Mr Trump promises to “make America great again”. The reason for the Russian leader’s bad personal relationship with Barack Obama is the US president’s wounding refusal to indulge the fantasy of superpower parity. Perhaps Mr Trump has the better understanding of Russian psychology. He never ceases to praise Mr Putin as a strong and decisive leader. The Republican party’s contender for the White House is not alone in cosying up to the Kremlin. Populists across Europe — Marine Le Pen’s National Front in France, Nigel Farage’s UK Independence party and the fascist Jobbik and Golden Dawn in Hungary and Greece respectively — have tipped their hats to Moscow. Mr Putin also has sympathisers on the left. Britain’s Labour leader Jeremy Corbyn is more comfortable denouncing US “imperialism” than challenging Russian revanchism. Until recently the foreign policy establishment was quietly preparing for a Hillary Clinton presidency. Mr Trump’s candidacy was a nightmare it would surely wake up from on November 9. The mood has changed. As the polls have tightened, Republicans and Democrats have begun to imagine Mr Trump as commander-in-chief. A dark quip among US generals — that they would remove the circuit boards before handing over the so-called nuclear football — no longer seems quite so amusing. The fears are that “shy” Trump supporters may not be showing up in the polls, that antipathy to Mrs Clinton could see centrists stay at home, and that the resolve of white working class voters to punish the elites could overwhelm Mr Obama’s winning coalition of educated whites, Hispanics and African Americans. Faced with compelling evidence of Mr Trump’s mendacity, misogyny and racism, too many people reply that “he doesn’t really mean all that stuff”. The organising fact for the rest of the world is that the US is the only nation that matters just about everywhere. It is no longer the hyperpuissance of the 1990s, but the capacity of a thin-skinned, shoot-from-the-hip president to wreak havoc is chilling. A lot of people in Washington are trying to persuade themselves that the checks and balances in the system would restrain him. Judging from my conversations this week, they are not succeeding in the task. The obvious fear is that a temperamentally unstable president Trump would lash out in a crisis. Robert Gates, the Republican former US defence secretary, says simply that he is “unfit to be commander-in-chief”. Mr Trump’s reaction to the latest bomb outrage in New York fitted the pattern. The US had to “knock the hell out of them … do something serious over there” — “them” being indeterminate and “over there” being the Middle East. The bigger danger lies in Mr Trump’s promise to withdraw — to tear up trade deals, throw up trade barriers against China, repudiate the Paris climate change agreement and the nuclear deal with Iran, and abdicate responsibility for the security of east Asia and Europe. Mr Trump’s policies are shot through with contradictions but one constant is his belligerent isolationism. America will go it alone. Hyper-realism, some call it. Dangerous is a better Word. Negative interest rates are here to stay. As you probably know, negative rates are the latest and most radical government “stimulus” measure. They basically turn your bank account upside down. Instead of earning interest on your money in the bank, you pay the bank to look after your money. Central banks in Europe and Japan introduced negative rates to stimulate their economies. The idea is that people will borrow and spend more money if they have to pay a “tax” to save money. Europe has seen a balance sheet recession since the economic crisis of 2008, it said, highlighting that a 10.9 percent increase in reserves at these banks has failed to increase lending to the wider economy. Instead, people are hoarding money. According to Business Insider, safe sales have shot up through the roof in Europe. In Japan, people are buying safes at the quickest pace since the financial crisis. Yet, they’re spreading like a virus. More than $13 trillion worth of government bonds have negative rates. Keep in mind, negative rates were just an idea a couple years ago. This is a serious problem for everyday Europeans. It’s also a major threat to Europe’s banking system. You see, banks make money by charging interest on loans. They’ve been doing this for centuries. But, thanks to central bankers, global interest rates are at their lowest level in 5,000 years. Many major European banks are now struggling to make money. Second-quarter profits at HSBC, Europe’s biggest lender, fell 45% from a year ago. Spanish banking giant Banco Santander’s second-quarter profits fell 50%. And Deutsche Bank's profits plunged 98%. The chart below shows the EURO STOXX Banks Index, which tracks 26 major European bank stocks. You can see that European bank stocks have plunged 42% since the European Central Bank (ECB) adopted negative rates in June 2014. [M]argins will not improve. Sixty percent of revenues is net interest income and as long as that's the case earnings will not improve. So return on equity is very low. 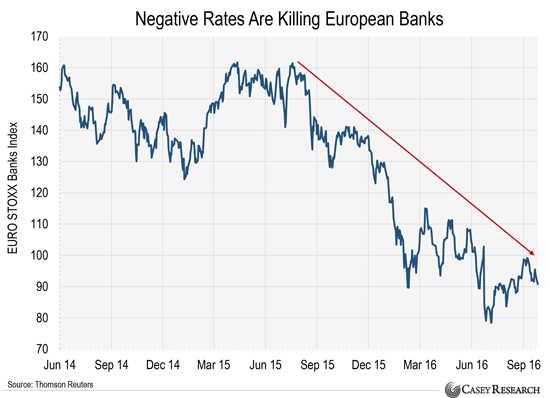 ➢ Bank of America (BAC) estimates that negative rates could cost European banks as much as €20 billion a year by 2018. ➢ Last week, the CEO of Swiss banking giant Credit Suisse (CS) warned that negative rates could lead to instability for Swiss lenders. In an effort to fix Europe’s economy, the ECB could end up destroying Europe’s banking system. After all, the U.S. doesn’t have negative rates yet. Plus, the Federal Reserve is talking about raising rates right now…not dropping them below zero. But here’s the thing: the Fed isn’t serious about raising rates. As we explained last week, it chickens out every time it’s close to raising rates. In March, it didn’t raise rates because of a bad jobs report. In June, it held off due to concerns about the global economy and “market volatility.” Last week, it didn’t raise rates because it’s waiting for the job market to improve. And you can bet it will “do something” if the economy runs into serious problems. There’s just one problem. The Fed is running out of ammo. You see, the Fed has already pumped $3.5 trillion into the financial system since 2008. It’s also held its key interest rate near zero for the past eight years. This means it will likely have to do something even more radical than zero-percent rates when the next crisis arrives. As you probably know, Bernanke ran the Fed from 2006 to 2014. Today, he works for the Brookings Institution, a government think tank. [S]ince the current low-interest-rate environment may persist, there are good reasons for the Fed and other central bankers to consider changes in their policy frameworks. [I]t is premature to rule out alternative or potentially complementary approaches, including the possibility of using negative interest rates. In February, Yellen said negative rates aren’t “off the table” if the U.S. economy runs into trouble. More importantly, the Fed has already been quietly laying the groundwork for negative rates. In February, it asked major U.S. banks to “stress test” their balance sheets for negative rates. This tells us something is very wrong with the U.S. economy. To see why, watch this eye-opening presentation. In it, E.B. Tucker, editor of The Casey Report, explains why a major financial crisis is already well underway. By the end of this video, you’ll see why the U.S. economy simply can’t stomach higher rates. You’ll also learn why this coming crisis is a threat to your wealth—even if you don’t own a single stock or bond. You can get started by holding more cash than usual. This simple step will help you avoid major losses if stocks crash like they did in 2008. It will also put you in a position to buy stocks when they get cheaper. We also encourage you to own physical gold. As we often point out, gold is the ultimate safe haven asset. It’s survived every financial crisis in history, and its value often spikes when governments do reckless things like print money or cut interest rates. 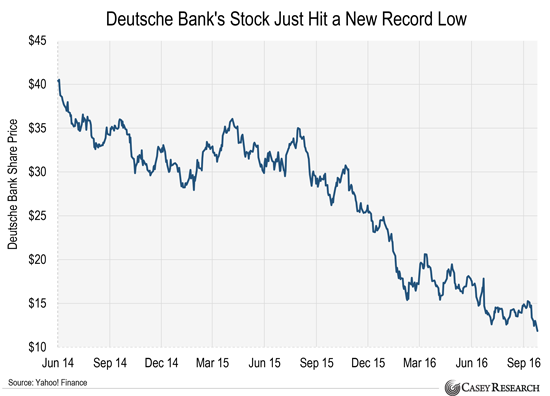 Deutsche Bank’s stock is in free fall. Today’s chart shows the performance of Deutsche Bank since the ECB introduced negative rates in 2014. You can see that the stock is down 70% over the past two years. On Monday, shares plunged 7% to a new all-time low. MADRID – During the European Union’s recent Bratislava summit, the first to take place without a British presence, several proposals to improve European security were made. Though some may argue otherwise, discussions on improved European security are both wise and necessary: after a period of paralysis and self-doubt for the European project, the EU must face its security problems and propose unifying initiatives. Europe’s citizens increasingly regard security as a high-priority issue and want the EU to show greater leadership. The EU’s friends and allies expect improvement in European security as well. Offering EU citizens security within the Union’s borders requires more stability abroad. Recent events have shown this clearly: the refugee crisis bedeviling the EU, for example, would be much easier to manage if the situation in Syria was different. Because security at home and abroad are so interrelated, the EU should not compartmentalize its policies – an idea that is well developed in the proposed new “Global Strategy” for the Union, presented recently by High Representative Federica Mogherini. Traditionally, nation-states have defended themselves against foreign threats through military means, while running their internal affairs according to a set of norms designed to protect their citizens’ rights. Today, military preparedness is still necessary to defend against external threats, but it is no longer sufficient. A “civilian” angle is needed as well. All assets needed to achieve security must adapt to the reality of today’s threats and conflicts. This means that the EU’s military capacities cannot be structured in isolation, but must work side by side with its civil capabilities (police agencies, intelligence units, the courts, and even non-governmental organizations). The capacity for a fused civil-military response to crisis must become integral to EU policy and that of its member states. The EU has already undertaken deployments that combine military and civilian capabilities. But it has always been clear that much more is needed to improve the efficacy of such actions. Indeed, the EU’s Treaty of Lisbon includes many measures along these lines, but most have not yet been implemented. One reason for this is the distraction caused by the EU’s economic problems since 2008. But now the gravity of the refugee problem requires that humanitarian and security issues be framed within a pan-European outlook. The division between the domestic and external capacities of EU member states simply is no longer sustainable. Fortunately, many of the capacities available to member states in their internal policies are also useful for their defense deployments. For example, it is increasingly clear that enhancing intelligence cooperation is essential. If the EU wants to extend the reach of its security policies, it will need more resources; but, above all, existing capacities need to be used better and more cooperatively. But such cooperation requires a strategic headquarters for all EU security-related operations, rather than maintaining the current model whereby operational centers are established on an ad hoc basis. Moreover, in order for the EU to achieve strategic autonomy, it needs a competitive European defense industry, with investment in research and development of defense technologies rising substantially as part of a common effort. The European Defense Agency’s Capabilities Development Plan was designed precisely with these requirements in mind. Advancing this plan will enable optimized use of existing member-state resources – thereby securing advantageous economic synergies – as well as precise identification of the additional resources required to achieve our goals. The legal basis for a mechanism for permanent, structured cooperation on security already exists, enshrined in the Treaty of Lisbon. Treaty provisions enable willing EU states to reinforce their military cooperation and deploy quickly for shared missions abroad. Activating this mechanism has been part of recent discussions within the European Council and seems to be the most viable way to deepen defense integration. And an EU with security and defense as one of its pillars would boost Europe’s global weight. Some still think that deeper defense integration may weaken other institutions, such as NATO, to which EU members belong. But the truth is that Europe’s ability to provide an effective collective response in a crisis would be welcomed by NATO (which would have more resources at its disposal) and the United Nations. Integrating EU defense, moreover, would facilitate NATO operations, so that groups of EU countries engaged in permanent structured cooperation could, for example, participate in the North Atlantic Council, NATO’s governing authority, as a single entity. The EU is defined not only by how it protects its own citizens, but also by what actions it takes outside its borders. Beyond ensuring that these actions are guided by international law, the EU should foster a global debate on the deficiencies of certain international norms in the face of today’s new conflicts. Even in this era of pervasive Euroskepticism, Europe’s citizens want a more decisive EU approach to foreign and security policy, which is necessary, beneficial, and part of our duty. The EU, after all, will be defined by its actions, and peace and security are among the public goods that it must provide, both within and beyond its borders. Do you really own something if the government forces you to make never-ending payments on it? You possess such an item, but you don’t own it outright. It’s an important distinction. A ridiculous threat to property rights has infected most of the world like a virus. Most people unquestioningly accept it as a normal part of life—like gravity or the sun setting in the west. The threat I’m talking about is property tax: that annual tax you pay whether or not your property generates any income. Instead, the government bases the tax on the underlying value of real estate you supposedly own. There is no way to pay off this obligation in one fell swoop. It hangs over your head as long as you hold title to the property. For practical purposes, you don’t really own anything you have to pay an annual property tax to keep. You are merely renting from the government. Suppose you bought a sofa set and coffee table for your living room for $5,000 cash and then had to pay a $100 tax each year for as long as you “owned” the furniture. Then suppose, for whatever reason, you’re unable or unwilling to pay the furniture tax. It wouldn’t take long for the government to swoop in and confiscate your furniture. In this case, you “own” the furniture as long as you pay the never-ending annual fee—stop paying and you’ll find out who really owns it. While many people would find an annual furniture tax absurd, they somehow think it’s acceptable for the government to levy an annual tax on homes, offices, and raw land. Respect for property rights and annual property taxes are mutually exclusive concepts. What’s yours is yours, and you shouldn’t need to pay the government for permission to keep it. It’s not uncommon for people in North America and Europe to pay tens of thousands of dollars in property tax every year… just to live in their own homes. And the burden will almost certainly continue to increase. Most governments continually raise property tax rates, especially governments in bad fiscal health. It’s very possible that, over a lifetime, the government could take more in property taxes than the underlying value of the property being taxed. And, just like the furniture example above, if you don’t pay property tax (AKA government rent) on the home you thought you owned, the government will confiscate it. This is not as uncommon as you might think. It’s estimated that thousands of people in Pennsylvania alone lose their homes annually because they can’t or won’t pay. Of course, there are many different ways to fund those services. Or, even better, we could leave them to the free market. But don’t expect that to happen. In fact, given the social, political, and economic dynamics in the U.S. and most of the West, I expect the opposite. Property taxes have nowhere to go but up. If you want to escape rapacious and ridiculous property taxes, those are your options. Ireland would have been on the list, but it recently adopted a property tax. This does not bode well for other financially troubled EU countries that could turn to property taxes as a solution—like Malta and Croatia. Colombia, Costa Rica, Ecuador, and Nicaragua have property taxes, but the obligations are generally negligible. Of course, the risk is that, since these countries already have property taxes in place, they could easily increase them whenever the government wants more revenue. The joke now doing the rounds is: if you want to punish your child, you threaten to pass on property to them… Greeks traditionally have always regarded property as a secure investment. But now it has become a huge millstone, given that the tax burden has increased sevenfold in the past two years alone. 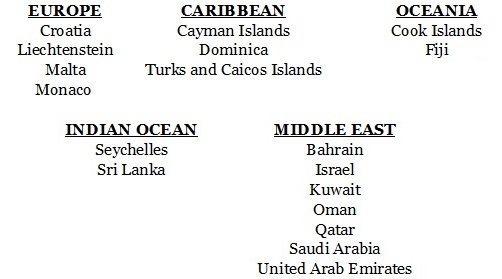 For my money, the Cayman Islands is the most appealing country on the no property tax list. It has never had any form of direct taxation, and most Caymanians are vehemently opposed to the idea. That history and attitude is a good sign the Cayman government is very unlikely to ever impose a property tax. As you likely know, owning foreign real estate gives you huge diversification benefits. However, deciding when and where to buy foreign real estate is a complex and highly individualized choice. Property taxes are just one part of the equation. When you’re weighing your options, don’t think of foreign real estate as a vehicle for a quick return. Think of it as a diversified long-term store of wealth—one the government in your home country can never confiscate. Wherever you decide to buy should also be in a place you would actually want to spend a significant amount of time. That way, the property will always be valuable to you, regardless of whatever else happens.